Show Me the Razzle Dazzle! 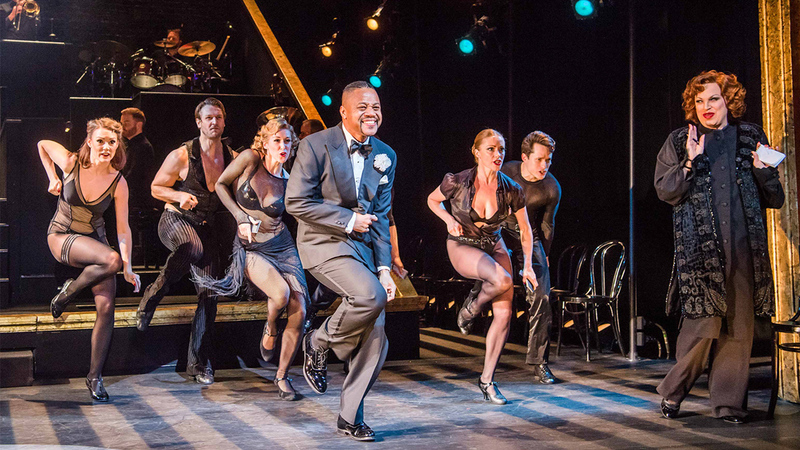 Cuba Gooding Jr. returns to Broadway in Chicago as lawyer Billy Flynn beginning October 6 for a limited run through November 18 at the Ambassador Theatre. It’s the Hollywood star’s first musical after making his Broadway debut in 2013’s The Trip to Bountiful. “It’s horrifying, but something I look forward to,” Gooding says of the opportunity that involves singing and dancing, something he’s never done in a film. The Oscar-winning Jerry Maguire actor performed the role in London earlier this year. “When I finally finished my run in July, I was sad because that’s how much that music affected me,” he says of Kander and Ebb’s show. His run on Broadway begins one day after his directorial debut in the indie film Bayou Caviar. We spoke to Gooding about joining the cast, currently starring Shiri Maimon as Roxie Hart and Naomi C. Walley as Velma Kelly. It’s magical. I just did 158 shows in London. It’s one of those things when your agent calls — of course, it’s a yes, but it’s just horrifying. I was like, “You know it’s a musical, right? There’s singing involved.” After working with a vocal coach for a month, flying to London, working with the company for another month, then stepping on that stage March 26, I realized that this is the moment in my life where all roads led to this one place. I was sad when I had to step down July 1st. When [producer] Barry [Weissler] said, “How would you like to do it on Broadway for six more weeks?” I was like, I’ve come full circle. It’s one of those things, to do a musical on Broadway as a feather in the cap for any serious actor, especially one born in the Bronx. How was this rehearsal process different than any other role you’ve played? I played ice hockey for 20 years and I boxed in gyms with professional boxers. I tell the guys all the time there’s nothing physically harder than singing and dancing eight shows a week for six days a week. On my day off I would sleep for sometimes 17 hours. My body would just shut down at the end of the week. It’s a drug that you can never get enough of. Some people may not realize you started your career break dancing. Can you tell me more about your dancing background? In 1986, me and my Majestic Visual Break Dancers auditioned for Lionel Richie, to be one of the official Olympic break dancers at the closing ceremonies of the 1984 Olympics, and we got the gig. We went from there to doing backup dancing for Paula Abdul videos. I’d always been a dancer and a gymnast, eventually moving on to becoming an actor. You move away from the dancing but you never lose that rhythm. It’s almost like John Travolta and Saturday Night Fever. You can see it’s infused every role he has done since. Had you ever had a singing lesson before this show? I’ve never sung before professionally. I’ve done some karaoke in the clubs. I was training with [my vocal coach] in person when I was in Los Angeles, but now because I’m in New York, I have to do Skype. It’s really been interesting. When was the first time you saw Chicago? Early 2000s, maybe? I didn’t remember a lot of it. I always remembered Mary Sunshine took her wig off, and the “Cellophane” number was something that always stood out. When I got the gig, I flew to New York and saw the play a few times in a row. That really was the first time I experienced it. That’s when I really got the whole spirit of the play and understood why it’s been around for 22 years. Did your parents take you to Broadway, growing up the Bronx? What was the first Broadway show you ever saw? I was born in the Bronx and raised in L.A. The first Broadway show, I remember flying to New York to do a press junket for Boyz in the Hood and saw Cabaret. Who is the one person who you want more than anything to come see you in Chicago? We had Angelina Jolie come see us in London. The one person who didn’t get to make it out there was my mom. My mom and dad met at the Apollo Theater, both as singers. When my dad passed away last year, it was one of these goals that I’ve always had to sing something. To think my mom’s going to finally see the performance is horrifying, but it’s something I look forward to.